YIF – Young India Fellowship is an initiative by Ashoka University to transform willing and talented individuals into agents of wide, effective and developmental social change. It also promotes diverse education through interdisciplinary education and advanced research in essentially important subjects related to the present like humanities, social sciences, and the natural and applied sciences. Since its conception in 2014, YIF has become the flagship programme of the Ashoka University offering a Post-Graduate Diploma in Liberal Studies & Leadership to the fellows after graduation. The fellows also have the choice to convert this diploma into a research-based master’s degree in Liberal Studies. If you are a graduate and aspire to be a Young India Fellow, find here all the relevant details related to YIF (Young India Fellowship). This article provides you with in-depth knowledge about the fellowship including its eligibility, application procedure, benefits, scholarships, selection procedure and more. The Young India Fellowship Program (YIF) is a one-year residential multi-disciplinary PG Diploma Programme which provides Liberal Arts education based on an efficient concept of Experiential Learning Module (ELM). The fellowship allows the fellows to pursue courses offered by the partner universities namely Carleton College, University of Pennsylvania, Sciences Po, University of Michigan, King’s College London, UC Berkeley, Yale University, Wellesley College and Trinity College Dublin. The table below highlights the complete overview of the fellowship including its objective, provider information, eligibility, rewards, application procedure and rewards. 1. Objective The aim of the fellowship is to improve the standard of higher education in India and allow for a more expansive and engaging learning module that is currently available in the country. 2. 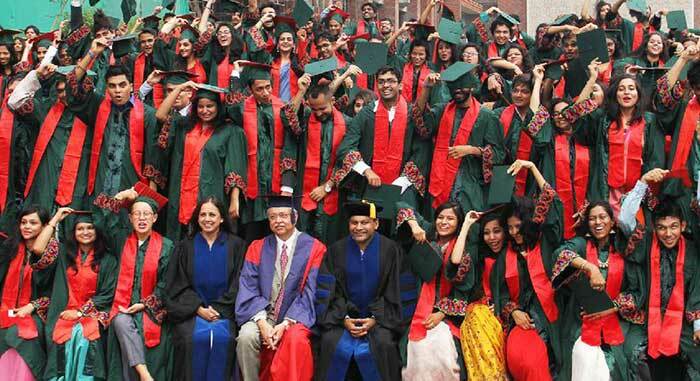 Fellowship Provider The scholarship is being provided by the Ashoka University in collaboration with the University of Pennsylvania School of Engineering and Applied Sciences (Penn). 3. Eligibility All applicants under the age of 28years, possessing a graduation degree are eligible for the fellowship program. 4. Fellowship Reward An opportunity to be a fellow at the Young India Fellowship (YIF), Ashoka University and be a part of the extensive program which encourages fellows to discover their full potential as leaders and actively pursue their vision for a better world. 5. 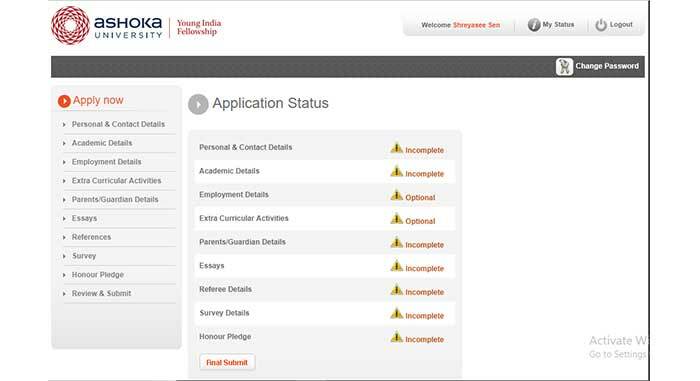 Application Procedure Apply online through the online portal of the Ashoka University. 6. Documents Required Academic Details, Resume/ Curriculum Vitae, Referee Details, Other relevant documents. Multidisciplinary Curriculum- YIF does not stick by a particular subject or philosophy. It is a multidisciplinary program and enables multiple perspectives through Experiential Learning Module (ELM). The courses in YIF include Literature, Gender Studies, History, Art Appreciation, Statistics, Mathematical Thinking, Psychology Management etc. Renowned Faculty- The fellows in Young India Fellowship are taught by a variety of outstanding teachers from India and around the world. The faculty is hugely respected and includes professors who have received their education from –ivy league institutions like Yale University, Harvard University, University of Pennsylvania etc. Experiential Learning Module (ELM)- The fellows in YIF are taught through Experiential Learning Module which means the theoretical knowledge is combined with practical experience for better implementation and learning. The fellows through this concept understand team building and gain problem-solving skills as they work with people from diverse backgrounds in a professional working environment. Inspiring Guest Sessions- The guest sessions are parallel to the academic curriculum. The fellows attend a lot of sessions conducted by global achievers. More than 450 eclectic and pre-eminent personalities have addressed the fellows like Madeleine K. Albright, Former Secretary of State, USA; Raghuram Rajan, Governor, Reserve Bank of India; Prannoy Roy, Co-Chairperson, Co-Founder and Mentor, NDTV and Dr. Shashi Tharoor, eminent parliamentarian and author have been amongst the exclusive guest speakers of the program. Critical Writing- An integral part of the YIF programme is critical writing. The fellows indulge in a world of ideas which enables them to develop and express their own ideas through lucid, engaging, ethical and well-reasoned writing. Peer Learning- The Young India Fellowship transcends nationality, culture and background of the people. The program exposes fellows to a mixture of diverse crowd professionally and culturally. A YIF classroom consists of scientists, engineers, lawyers, students from the arts, business and humanities background as well. Such crowd provides immense exposure to the fellows and help them to learn and settle in diverse atmospheres. Financial Support- The institution is supported by various philanthropists, institutions and corporate leaders. These links of the institution offer opportunities to the fellows from all strata of society, providing them with either partial or complete financial aid. *The dates mentioned above are tentative and subject to change as per the discretion of the scholarship provider. The Young India Fellowship brings together about 300 bright, young and intellectual individuals who show potential to be agents of social change and trains them to stay committed to it. A Young India Fellow does not have a specific profile but essentially requires to show leadership potential along with some of the other qualities including humility to believe that there is always more to learn, a deep-rooted ambition to solve problems and make an impact on society and qualities of integrity, self-awareness, energy, initiative and open-mindedness. A recognized undergraduate or postgraduate degree in any discipline. Strong academic record and extra-curricular involvement. A YIF fellow needs to have a passion for an idea or issue which could have wider social/business/academic implications, rather than harvesting personal benefits they think about improvement on a bigger level. If you think this fellowship provides you with exactly what you seek and you have the amount of dedication it requires, here’s a step by step procedure to fill the application to save your time. The fellowship follows a rigorous 3-step admission process that combines past academic achievements with the broader interests and activities of the candidate. 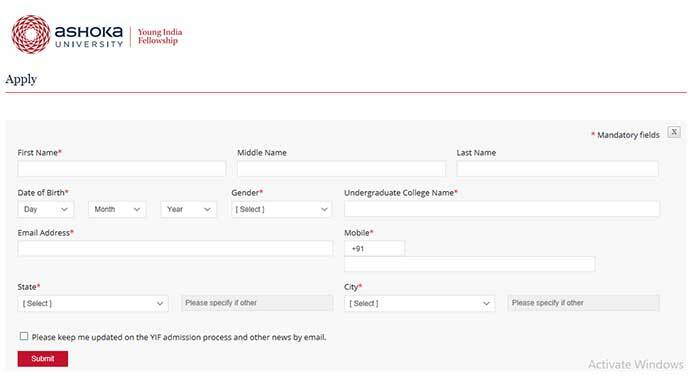 Register for the Young India Fellowship by creating an account on the Ashoka University Portal. The password will be provided on the registered e-mail address of the applicant. After registering and receiving the password in the e-mail id, log-in the portal with the provided credentials. Every year the application number for the program increases by a significant amount because of the popularity of the fellowship. This part of the application process is the most important part where the applicant provides maximum details about them. The essay section is formulated to get information about the aspirations and journey of the applicants along with the values they behold and consider important in their life. Thus, an applicant should be really careful while filling the ‘Application Details’ in the form. Since this is an elimination round, after submitting the carefully filled in application form some of the applicants are short-listed for the next round. Applicants are interviewed on the telephone for further consideration. The motive of the telephonic interview is to get to know the applicant better and assess if he/she is a suitable candidate for the fellowship program. The selected applicants will be informed about the date and time of the telephonic interview via mail. The applicant should make sure to be present in a suitable seating and comfortable place in order to avoid any glitches during the course of the interview. The applicants who get selected in the telephonic interview will further be called in the Ashoka University campus for a Personal Interview. This will be the first instance when the applicant and a faculty member of YIF will come for a face to face interaction. A face to face interview will be held along with a comprehension test to analyze the student and test his/her basic verbal and written communication. After this, the final selected applicants receive intimation of results through call or mail. The final selection will be based on the cumulative score of all the three stages. Stage 1- Application Assessment: All applications are reviewed by the selection committee of YIF consisting of faculty and executive members of the programme. Candidates are evaluated on the basis of their academic performance through school and college and their involvement in extra-curricular activities. Their interests and concerns along with their thoughts and motivation for a meaningful life as expressed in their essays are also considered. Stage 2- Telephonic Interview: The short-listed candidates are interviewed on the telephone. Candidates are notified in advance about when the telephonic interview will take place via mail. It is typically a conversation regarding the information that the candidate has mentioned on their application and may include a discussion about their areas of interests. The duration of the interview is usually around 20 minutes. This is an elimination round, which means, if selected in this round they move on to the Personal Interview round. Stage 3- Comprehension Test and Personal Interview: On the day of the Personal Interview, candidates will be required to take a comprehension test just before the interview. They will be tested on their reading, understanding, articulation skills and critical thinking ability, not on their knowledge of subject matter. Candidates are interviewed in Delhi, Mumbai, Kolkata, and Bangalore. International candidates have the option to appear for interview on Skype. The Ashoka University is an altruistic educational institution founded by eminent scholars and visionaries to provide a liberal education to the students of the country which goes at par with the best universities around the world. Located in the Rajiv Gandhi Education City near Delhi, the institute is at its accretion in its focus to achieve its aim of helping students become efficient individuals who think critically about issues of the present from several perspectives, enhancing their communication skills and become leaders. One of the very unique aspects of the institute is its pool of cultural diversity. The Ashoka University has around 1400 students on its campus from over 17 countries, the students get an opportunity to indulge and understand people from different places around the world. The University provides world-class interdisciplinary education through its undergraduate and postgraduate programmes led by their internationally renowned faculty. In case of any further query related to YIF, its eligibility, application procedure, rewards and more, the students are free to contact the fellowship providers on the below-given contact details.